Components: Increasing Speed and Risk –Veracode, Inc.
Java object serialization is a feature of the JDK that is far too often overlooked. When a developer puts together a prototype or cooks up a proof of concept, simply saving a serialized Java object to the local file-system, rather than integrating a NoSQL database or a relational system to provide persistence, is a serious time saver. This ObjectOutputStream example will demonstrate just how easy it is to integrate Java object serialization and deserialization into your applications. In this Java serialization example, we will use both the ObjectOutputStream and the ObjectInputStream to save and retrieve the state of a simple JavaBean. The POJO will be serialized and deserialized to and from the local file-system. Before you can perform Java object serialization, you first need to create an instance of the class. A call to the the constructor of the class to be serialized achieves this. You then need to decide the destination of the serialized instance. Will Java object serialization target the file-system? Will the Java object serialized across a network? Will the serialized Java object be delivered to an external system. In this case we will perform file-system based Java object serialization. That means we must create an instance of a FileOutputStream and point it at a file on the file-system. As seen in the Java code above, the serialized Java instance will have its state written to a file named score.ser, which sits in a temp directory off the root of the C: drive. This file must be created first before you run the example, lest the program will throw a runtime exception. With the FileOutputStream created, we simply pass the instance to the constructor of the ObjectOutputStream. The combination of the FileOutputStream and the ObjectOutputStream will allow Java object serialization to happen at the file level. When Java object serialization is complete, both the ObjectOutputStream and the FileOutputStream can be closed. 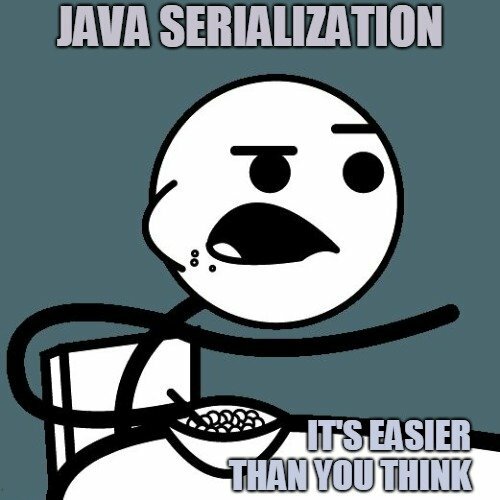 Of course, Java object serialization is only half of the job. The other half is Java object deserializtion, which we accomplish with the FileInputStream and the ObjectInputStream. The first step to perform in Java object deserialization is to declare a blank instance of the Score class to be initialized. Since we expect the JVM to perform Java deserialization, we don’t need to create an instance of the Score class, but instead, we declare an instance and wait for the Java deserialization process to initialize it. The next step is to point an instance of the FileInputStream at the file that was created by the serialization process. That FileInputstream is then passed into the constructor of an ObjectInputStream. When Java deserialization is complete, the ObjectInputStream and the FileInputStream can both be closed. System.err.println("\nError creating Score object. None exists?\n"
You will notice at the end of the getScore() method that there is a check to see if the score instance is still null. If it is, then Java deserialization has failed, which most likely is due to the fact that an instance of the Score class has never been subject to Java object serialization in the first place. To account for that possibility, if the instance does come back null, a new instance is created and serialized. Future attempts to deserialize this instance will succeed. And that’s it. This ObjectInputStream and ObjectOutputStream example demonstrates just how easy it is to perform Java object serialization and deserialization.